This machine is widely used in clothing,shoes and hats, luggage leather goods, belts, scarves, curtains, mosquito nets,rubber bands, handicrafts, decorations and other industries. 1. 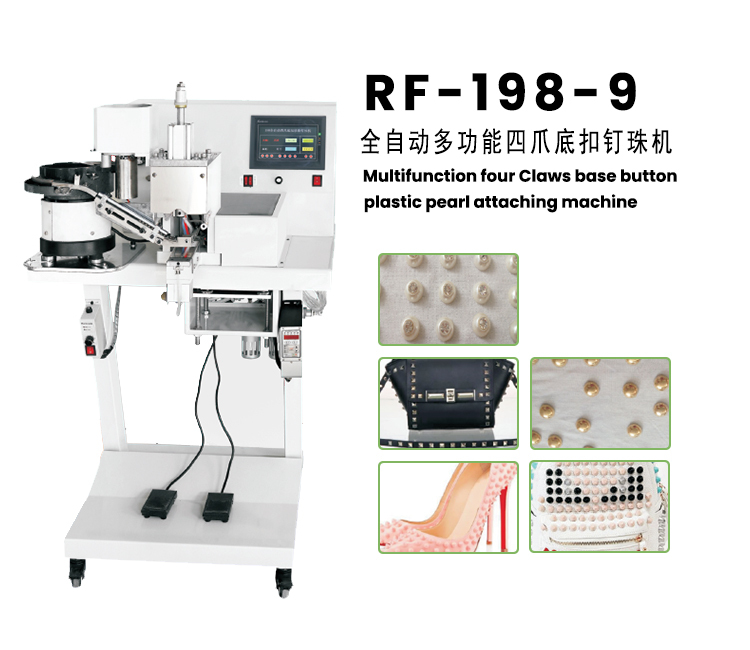 This machine is suitable for round,semicircular, bucket shaped, conical, square plastic buckle, bottom buckle forfour melon buckle nail buckle operations. Only need to change the mold to beable to play a variety of shape of the face buckle. The new design concept issuitable for multiple use of one machine, thus greatly saving the productioncosts of customers. 2.The utility model has the advantages ofsimple operation and beautiful effect. Is the good product which each domainchooses. 3. Adopt the new type of vibrating platedevice and high precision mould, make the face buckle and bottom buckle lowerbuckle more smoothly. Laser positioning, pin position error. 4. The fastening degree can be adjustedaccording to the need. 5. Adopt touch control panel to adjustspeed. 6. The use of imported pneumatic componentsincreases the stability and durability of the machine.